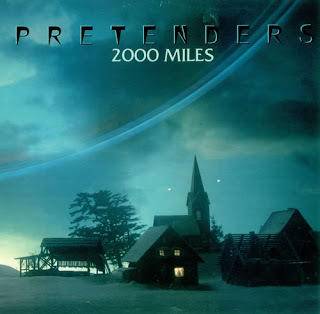 The song '2000 Miles', that was so beautifully covered by Nancy Wallace last year, was originally a hit in the United Kingdom for The Pretenders. It peaked at number 15 in December 1983 and has since then slowly become one of the most popular original Christmas songs of the 1980s. From the lyrics, it is clear that '2000 Miles' is not a song for those for who Christmas is in the first place a joyful celebration with family and friends. It is for those people who have experienced the other side of Christmas, a song for people who are estranged from the ones they love knowing that, despite all the hope they had, they won't be together with them this Christmas. The song is very much related to the drama that happened to the band in 1982 and 1983. The Pretenders were formed in 1978 in Hereford, England, by Chrissie Hynde, who was originally from the United States, Ohio to be precisely, but had moved to London in 1973 to work for the New Musical Express. She was also working in the shop of Malcolm McLaren en Vivian Westwood, and was involved with both early incarnations of The Clash and The Damned. After first having played in some punk bands and having recorded some of her own songs as demos with a temporary backing band, Chrissie Hyndre found a steady line-up with James Honeyman-Scott on guitar, Pete Farndon on bass, and after trying out another drummer first, Paul Chambers on drums. With this line-up, The Pretenders recorded their self-titled first album, which was a big commercial and artistical success. After a second LP, simply called 'The Pretenders II', a drama for the band started to unfold, which put the band on a hold for some time. First, Chrissie fired Pete Farndon and two days later, guitar player James Honeyman-Scott died of a drug overdose. One year later, in 1983, Pete Farndon died in a drug related accident. Chrissie Hyndre wrote '2000 Miles' for James Honeyman-Scott and knowing this, sentences like 'He's Gone', 'I miss you' and 'I'll think of you, where ever you go' get a even more dramatic meaning. Chissie sings it beautifully, accompanied by the melodic guitar tones of Pretenders' new guitarist Robbie McIntosh. '2000 Miles' was produced by Chris Thomas, and also appeared on The Pretenders' album 'Learning To Crawl', that was released the following year, in 1984. The single was released in the UK on 7” in two different editions: one with an ordinary cover, and one with a gatefold cover. In the US, '2000 Miles' was not released as a single in itself, but as the B-side to the single 'Middle Of The Road'. The single came with a video, in which Chrissie Hynde was dressed as a member of the Salvation Army, and she sang the song in the middle of a snowy landscape. The UK pressing of the 7” came in two editions: one with an ordinary sleeve (ARE 20) and one with a gatefold sleeve (ARE 20F). In 1995, a new recording of '2000 Miles', recorded live with The Duke Quartet at Jacob Street Studios, London was released as a CD single, with as second track, another Christmas song, “Happy Christmas”. That was a bit of a misleading title, as 'Happy Christmas', also recorded with The Duke Quartet, was a sad sounding, somewhat bluesy song. Besides Nancy Wallace, there have been others who covered the song, which include Coldplay, KT Tunstall, Natalie Imbruglia and, on 7”, the Holly Cole Trio in 1989, Syd Straw, who combined it with another early 1980s Pretenders hit, 'I Go To Sleep', in 1992 and the Mighty Mighty Bosstones, in 2010. And very recently, The Unthanks released the 7” as the A-side of a 7” that was part of their 10th Anniversary 'Memory Box'.